Product prices and availability are accurate as of 2019-03-08 23:42:16 EST and are subject to change. Any price and availability information displayed on http://www.amazon.com/ at the time of purchase will apply to the purchase of this product. This Dragway Tools model 110 sandblast cabinet features a 48 in. x 24 in. x 24 in. inside working area and is a great addition for any shop. 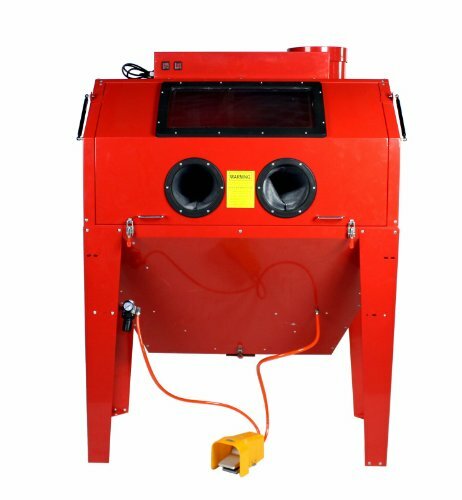 This sandblasting cabinet can be used for surface finishing, preparation, and modification on a variety of materials including prepping metal parts for paint, removing rust and corrosion, and removing paint and other surface contaminants. May also be used to etch glass. The built-in dust collection system results in a dust-free environment when sandblasting. To use this sandblasting cabinet, connect a 5 CFM or larger air compressor and add blasting media, such as Black Beauty® abrasives, steel shot, silica sand, corn cob, walnut shells, crushed glass, and glass bead. Sandblast Cabinet - Model 110 , 15 Cu Ft., 80-125 PSI. One (1) set of heavy rubber gloves. Foot pedal triggered spray gun. Five (5) replacement films for front glass. Five (5) replacement films for light glass. Overall Height: 65 in. x Width: 52 in. x Depth: 38 in. Interior Working Area: 48 in. x 24 in. x 24 in. Hinged Door Opening: 46 in. x 13-3/4 in. 14-gauge powder coated steel frame. Features one top door for easy loading and unloading. Steel and brass constructed foot pedal controls the spray gun. Spray gun features an ergonomic grip. Gravity feed system continually recycles and reuses the blasting media. Compatible blasting media includes Black Beauty® abrasives, steel shot, and silica sand. 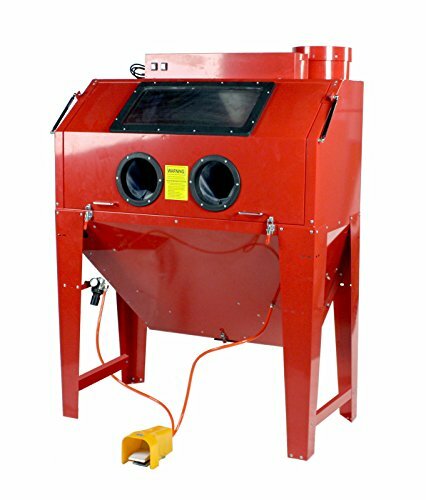 High-volume dust collector eliminates dust in the blasting area. Free residential delivery and lift-gate included. Prep metal parts for paint, remove rust and corrosion, and remove paint. Built-in dust collection system for a dust-free work environment. Connect a 5 CFM or larger air compressor and add blasting media to start sandblasting. Gravity feed system continually recycles and reuses the blasting media.